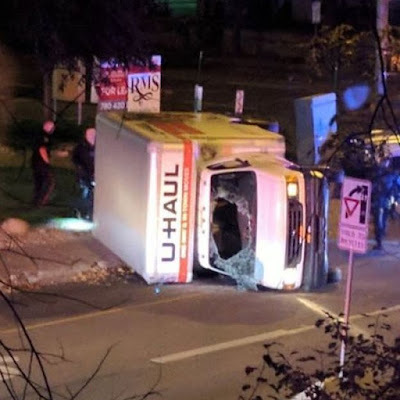 Eye On The World: Canada: Five injured in terrorist attack -- UPDATE: by a Somali "refugee"
Canada: Five injured in terrorist attack -- UPDATE: by a Somali "refugee"
(Edmonton) Last night, at about 8:15 p.m. near Commonwealth Stadium, an officer working traffic control for a Canadian football league game was hit by a car, the driver then jumped out of his vehicle and attacked the injured policeman with a knife, where the male attacker stabbed the officer several times before fleeing the scene on foot. The officer was taken to a hospital, but his injuries are not critical. At around 10 p.m., police held a news conference that a manhunt was underway, but that there was no threat to the public. Just before midnight, a white van was pulled over at a checkstop. When a police officer checked the driver's name, he recognized it as being similar to the name of the registered owner of the car that had struck the officer at Commonwealth Stadium. The van immediately sped off toward downtown Edmonton where streets were filled with Saturday night bar crowds and football fans. "Throughout the chase, the driver of the van deliberately went out of his way to hit pedestrians, injuring 4 in the process. The chase was brought to an end when the van flipped over and the driver arrested. Inside the cab was found a black ISIS flag. I suppose Edmonton police are now regretting stating that the man who attacked the policeman at 8pm wasn't a threat to the public. #BREAKING: @RCMPAlberta say 30-year-old #Edmonton terror suspect Abdulahi Sharif is a Somalian national. Currently in Canada as a refugee.